Every once in awhile our amazing seamstresses will come across a fabric that impresses them to create for someone special in their life. One such seamstress, with our Madison Coat pattern in hand, began to cut, gather, and stitch a darling coat for her newest granddaughter. It turned out SO fantastic we just had to add it to our shop for all of you! What fabric did she use you ask? Minky Dot fabric is not only a supremely soft micro-fiber but the polka dot feature has a “pop-out” 3D effect that is uber cuddly. The Peter Pan style collar, puff sleeves, and large silk covered buttons bring an air of whimsy and innocence. A high waisted bodice complete with subtle gathers will enhance the baby doll beauty in any little girl. In fact, you will want to pinch her cheeks just to make sure she is still real. We loved this little Minky Coat so much we couldn’t help but make a pair of matching boots! Starting with the same Minky fabric, a large silk covered button was fastened along with a looped elastic. This makes dressing baby’s feet quick and easy! What mom wouldn’t love that! That is not even the best part, the insides are fully lined with synthetic fur that is so snuggly you will wish you could crawl inside. Brand New Holiday Wedding and Special Occasion Wear. Beautiful for Bridesmaids, Flowergirls, or a Special Night Out! 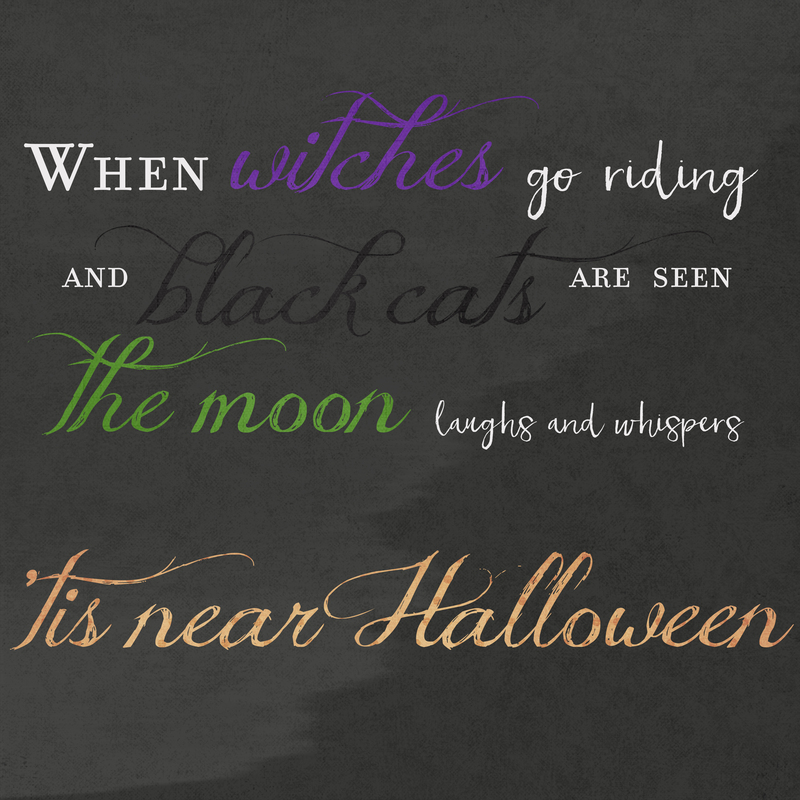 Check Out Our NEW Katy Lane Collection Holiday Designs! 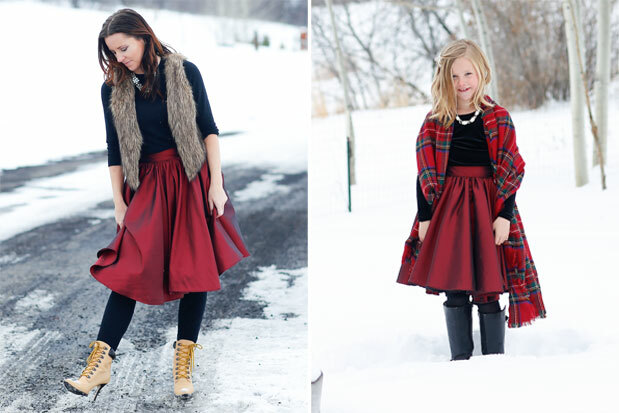 Katy Lane Collection has new holiday skirts for women. The full circle cut design creates billows of fabric along with enticing volume and flow. Just imagine these gorgeous skirts in a wedding line of beautiful bridesmaids. Or picture yourself floating across the room during a dinner party, dance, anniversary, gala, or any other special event–all eyes will be one you! Not only do these skirts look the epitome of elegance, they make you feel like the belle of the ball. 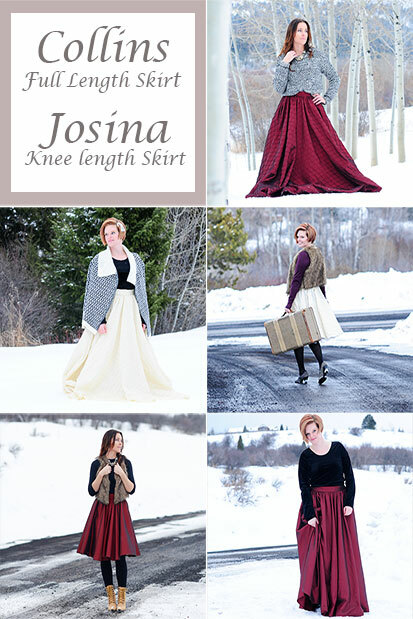 We have full length skirts (Collins) for the utmost formal events, and knee length skirts (Josina) for a little flirty fun. Flower girl Naomi full length circle skirt. 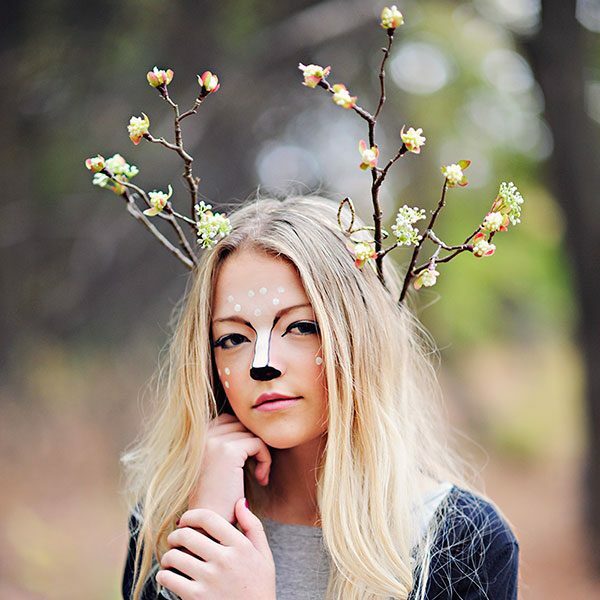 Our flower girl designs have all sorts of different applications. Have matching bridesmaids and flower girls. Or shake things up with diamond textured bridesmaids and smooth textured flower girls. Maybe differentiate the two with lengths; full length for bridesmaids, and knee length for flower girls. The possibilities are endless! Also, not only will the girls look adorably sweet in these skirts, they will LOVE the way they twirl! Did we mention the options? 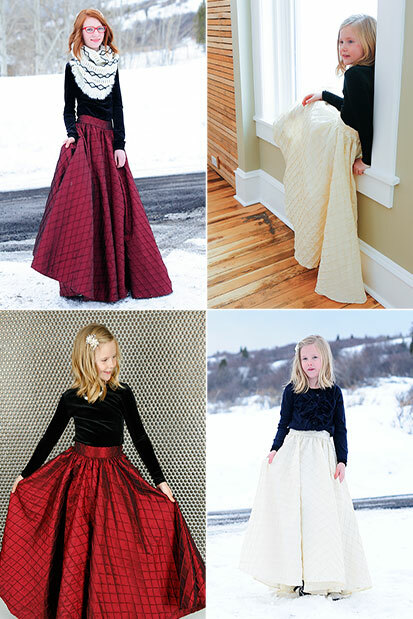 Women and girls skirts come in full length or knee length, and your choice of burgundy smooth, burgundy diamond, and ivory diamond color and texture. These skirts above and below are pictured with our soft velvet shirts. Monroe for the girls, and Hartley for women. Dress alike, but use different accessories. 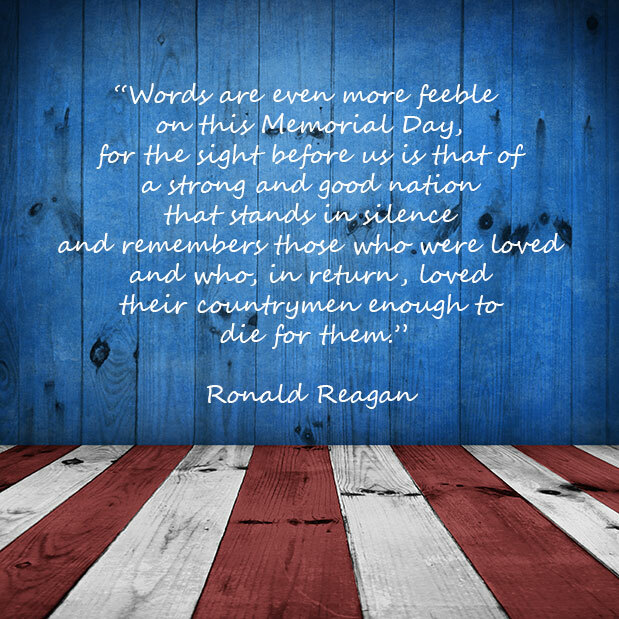 One final thought. 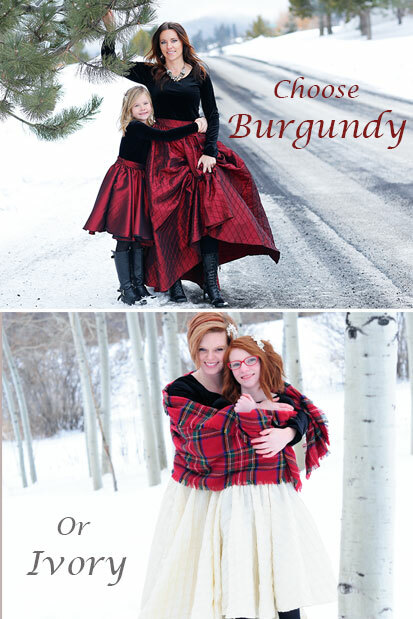 How about a mother daughter photo memorial. Every parent knows that children do not stay little forever. Capture their vibrant youth within your heart–and take photos often! These will be priceless in the future. Oscar Wilde once said, “No man is rich enough to buy back his past”, but luckily we can take photos to remember it. (top left) The Skye dress is made from our vibrant aqua blue dupioni silk. The over-dress is fashioned from embroidered lace netting, and it’s absolutely gorgeous! Tiny floral details are embroidered throughout the lace. A handmade silk rosette is fastened off-center at the waist. A silk ribbon belt ties at the back, atop the silk-covered buttons. The Skye dress has puffed sleeves and is below-the-knee in length. This two piece set includes the silk under-dress and lace over-gown. See the matching slippers here! (top center) The Kira is a classy midnight blue dress in dupioni silk. 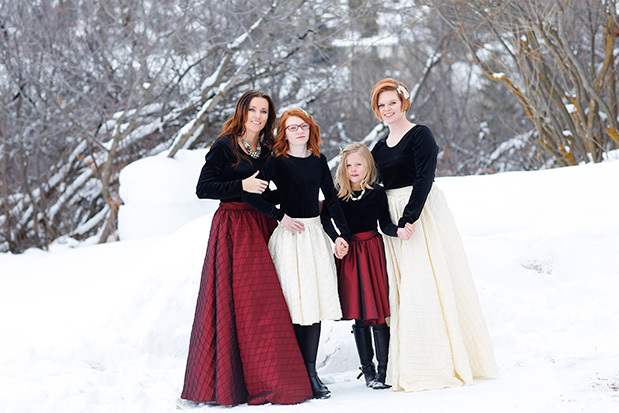 A traditional puffed sleeve, and volume skirt design makes for a classic holiday look. A cream silk ribbon sash ties in the back, above silk-covered buttons. A tulle pouf with a shiny button center is a pretty accent. Handmade silk rosettes top a bed of tulle and bead plumes, making a fancy statement headband. Soft, wide lace ensures her comfort. The Kira is a two-piece set that includes the party dress and headband. (top right) The Madeline is the perfect pink party dress for your little prima! Luxurious pink dupioni silk and regal embroidered lace are fabrics fit for royalty. Handmade pink silk rosettes grace the bodice and headband. Each is centered with pretty beads and sit atop sheer cream tulle. The Madeline features puffed sleeves and is below-the-knee length. This two-piece set includes the party dress and statement headband. (bottom left) The Ella is a stunning red silk dress, topped with ornately embroidered cream lace over-dress. A silk ribbon sash is topped with a simple pouf of cream tulle, centered with a large sparkly bead. The lace over-dress features puffed sleeves and is below-the-knee length. A handmade silk rosette is nestled in soft ostrich feathers, all atop a comfy wide lace band. This three-piece set will be the cherry on top at her event! (bottom center) The Ruby is a precious pink gown that’s sure to add a little sparkle to her special occasion. Pink dupioni silk is decorated with gorgeous beaded lace trim. Puffed sleeves and a short, above-the-knee length are perfect for your little mover! A row of silk-covered buttons fasten the back of the dress. The matching pink diaper cover has little silk ribbon bows at each leg opening, and is included in this two-piece set. Accessorize with the Ruby Shoes to make her toes twinkle! So cute! (bottom right) The Fiona is simply delightful! Made from your color choice of dupioni silk. A sheer textured overlay has petite polka-dots. It allows the richly colored silk to shine through. An over-sized silk bow decorates the top of the bodice, near the shoulder of this A-line dress. A matching silk diaper cover and bow headband complete this three-piece set. We love these Leather Ballet Moccasins with this dress. The Fiona is simply adorable! 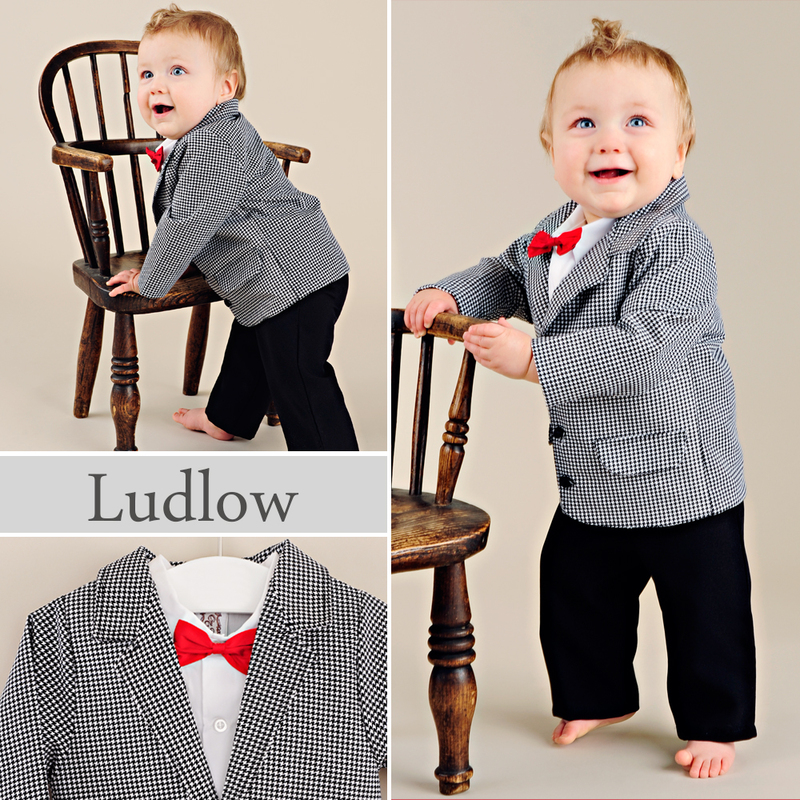 The handsome Ludlow Boys Holiday Outfit is made to match the Lyla Holiday Dress. 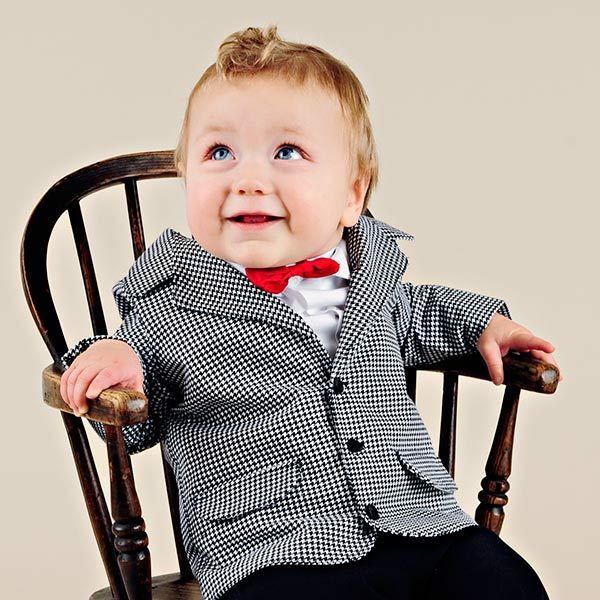 We are loving this adorable baby suit coat set! Shiny black buttons and faux pockets decorate a houndstooth suit coat. We love this classic black and white print that’s so trendy right now! A clean-cut white body shirt is a great staple that your little gentleman will use over and over. The Ludlow pants are solid black. They feature a flat front and elastic back waistband. The red bow tie adds a pop of color to complete your sharp little guy’s look. These four pieces are all included to make holiday outfit shopping easy for you. So convenient! We are excited to re-introduce one of our favorite baby girl Christmas Dresses this year: the Lyla. Our Lyla is a pretty A-line dress made from a delightful houndstooth fabric. This mini black and white pattern is classic and trendy for her holiday style. The Lyla features a baby doll neckline with a gentle gather for feminine flair. The black is echoed on the bias trimmed puffed sleeves. A red carnation adds a pop of color of center on the dress front. An adorable ruffle back diaper cover peeks out underneath. Complete her holiday look with our Black Baby Tights and our Leather Ballet Moccasins (shown in red). Don’t forget to layer our warm and comfy Bamboo Camisole Bodysuit underneath! 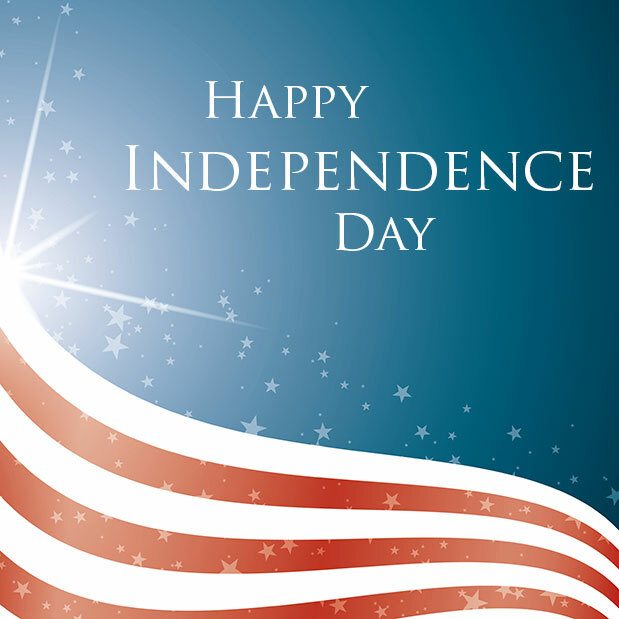 Wishing you a happy and safe Independence Day! Independence Day is this weekend! Are you ready? Need some fun ideas for food and snacks to keep your crowd happy? 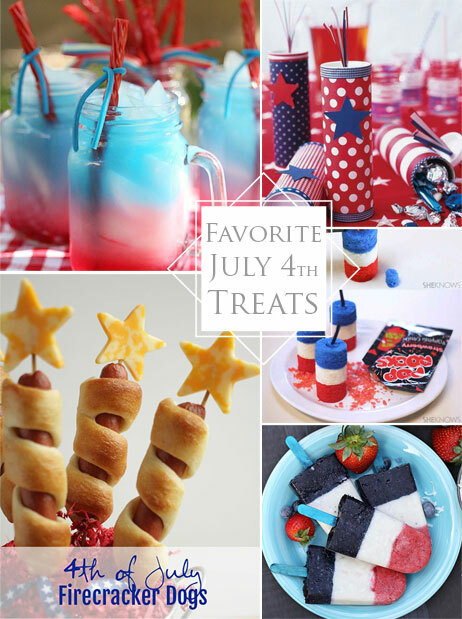 Today we’re sharing a Pinterest roundup of our favorite Fourth of July treats. What to drink… This Patriotic Punch from MomEandeavors.com will have your kids puzzled and delighted! Don’t worry about the preparation. It’s not rocket science. We love a Twizzler straw, too! Delightful dinner… How creative are these Firecracker Dogs from HandmadInTheHeartland.com? They’re sure to please your crowd of littles this Independence Day. You could even try a grown up version with Bratwursts! Pass the ketchup, please! A cool treat… Let’s add a little fruit to the menu with these healthy Firecracker Fruit Pops from MillionMoments.net. She uses strawberries, coconut and blueberries. Yum! Dessert with a bang… Okay, what kid (or adult) wouldn’t love these Firecracker Cakelettes from SheKnows.com!? We know they’re adorable. But the best part is the surprise inside! Soo fun! Treats for the show… Keep their busy little hands and mouths quietly entertained with these Firecracker Favors from GoodHousekeeping.com. These treat boxes will (hopefully) keep the fun coming as long as the firework show. We hope these Fourth of July treats were inspiring! Still puzzled about what activities to plan? Check out this post on fun family activities for the Fourth of July.